Elms memories - Faringdon Community Website. It has been decades since I was in Faringdon. I left the school in 1977 - abruptly following an incident in Faringdon - I was attacked on the afternoon after my Biology O-Level - Part 2 (B). My parents simply removed me from the School and that was that really. It was a bit of a mess really - they had no idea - who did in those days. However, as I sit in Germany (new home) I do wonder what happened to all my classmates - where did they go, what did they do? The Grounds at the Elms were just marvellous - each year had a lawn - fifth form, lower sixth and upper sixth. We had a swimming pool and tennis courts, a puppet theatre and sports field (in summer track - in winter hockey). We had a Tuck Shop - below the Science Labs (ground floor). The uniform was great - and you could win belts for: deportment and sport. In summer our hats were straw - in winter grey or navy felt. I remember very clearly the school, the teachers, etc. I even won the fancy dress (a Witch Costume). There were all those events, the Xmas Drama Presentations (there was a word for them). Each form had to stage and entertainment piece. I remember some years were a bit wild. We also sat in the Assembly Hall to watch films: Italian Job, there was also a 1970s film about women/men changing roles (so quite progressive for its day). I left after the 5th year - 7 respectable O-Levels from Oxford Examination Board. Art, English (lit), English (Lang), Maths, Latin, Biology, History. I can still remember most of the questions! My parents thought it best to put distance between me and Faringdon - not sure they were right. The last time I was in Faringdon was in 1979 - I was then at Art College - it was the Winter Vac - so was visiting Carters (my old employer - Saturdays, Evenings and School Holidays) to pick up provisions and have a gossip with my ex-supervisor Mrs Cornish! John Carter was my Manager - and bless the man - reading the printout of my Pension (produced by Stralsund, Germany) Carters regularly paid into my pension scheme - the earliest entry 1974. Wasn´t that nice of them and at the time I never knew! I´ve driven past Faringdon on the Bypass - I guess it has changed quite a bit since then. Do the busses still leave from the Market Place? The places I remember: solicitors on the Corner. Lloyds Bank, The Bell, a haberdashery, Larkins, Chemist, two shoe-shops, Carters the Butchers, Carters the Greengrocers, Anne-Marie´s the Hairdresser, The Clock Maker, the Crown, the photographer, the Wheatsheaf, the Bargain Centre, the Sweet Shop, Shepherds the Bakers, there was another one too opposite Carters the Grocers, the Newsagents, Pitts - a supermarket of sorts, there was the Travel Agents, Dr Tobin. Gloucester Street and London Road always had traffic Jams. Susan Morgan - very funny - gifted in languages - made up and fluent in "Eggy"! Judith McGann - tall large girl - like a statue and therefore always came across as more mature - but recollections of her nice. I passed the scholarship exam, so no fees were needed. It was still very costly- the summer and winter uniforms, the different pairs of shoes, the books we needed. Uniforms could only be bought from a Cheltenham shop, which visited the school. ​We had school assembly every morning- a religious occasion with prayers and readings. Great excitement. 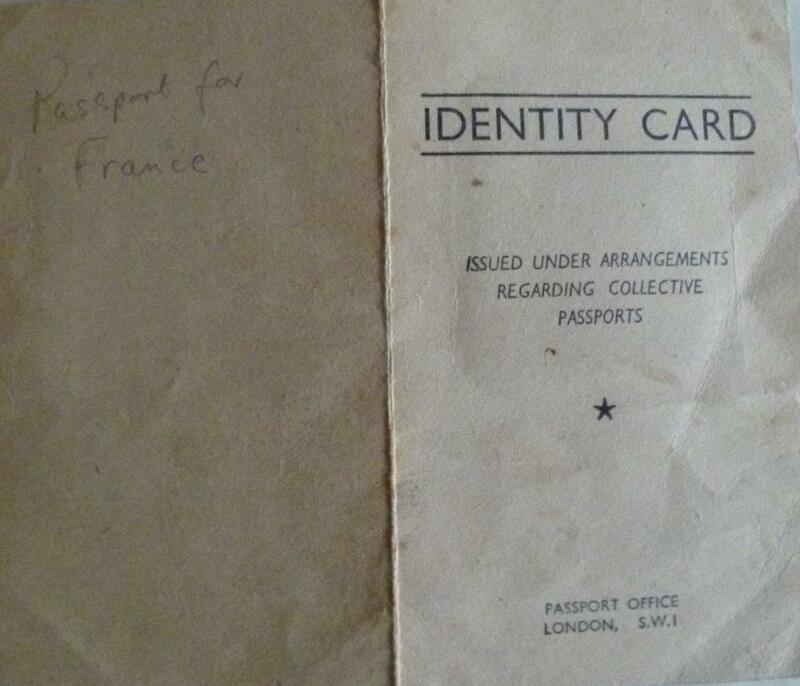 The first school trip abroad after the 2nd world war was in 1953 to Bayeux, France. A​ collective passport was required. General Thanks Giving ( Almighty God, Father of all mercies..........) Friday pm. My mother ( Mollie Norton) was at The Elms from 1926-1933. She lived in Stanford in the Vale. When she started the headmistress was a Miss Bartell - I think that's how it was spelled- a real dragon according to Mum! In 1929, Miss Moore became headmistress and she was there until 1957. I actually had Miss Moore for a couple of years. It was a fairly small school in the 20s and 30s, almost certainly less than 100 and some were younger- from about 8+. 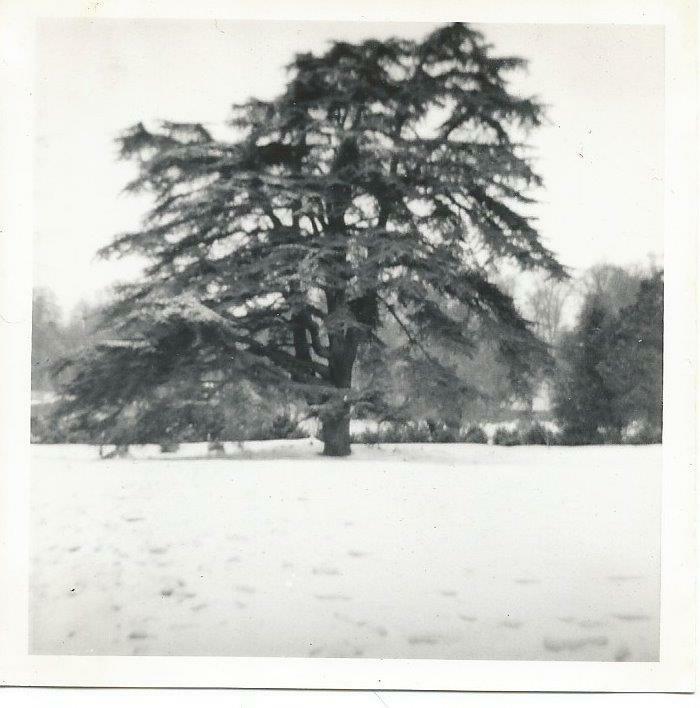 The lovely cedar of Lebanon in Jan 1963. Only 6th formers were allowed to go on the grass and sit under the tree. Until then, we were corralled on the tarmac area at break. Prior to actually starting school we were required to attend, with our Mothers, the uniform evening - all uniform was purchased from the designated school tailor or the school. Included was a length of grey material with instructions for making up the awful P.E outfit known as 'greys', elasticated at the waist with a four inch hem so that it could be let down as we grew. This garment was to last (and did) our whole school life. It suited no one and we froze in winter on the hockey pitch when Miss Bell was snuggled up in a thick jumper! White t-bar canvas shoes with white soles were ordered for wearing in the hall – no black soles allowed, and of course that grey felt hat. I remember my Mother taking the opportunity to ask if I could be addressed in school by my second name – Robin – which was the name I was always called by. Not acceptable! So I was Anna in school and Robin out of school. Now only the Dr. and Dentist call me Anna. My first year, with Miss Pain as class teacher was spent in a hut on the edge of the sports field as the new teaching and science block was still being built. The swimming pool had just opened and my cousins and their friends who had preceded me were fed up that they'd fund-raised for it, but never had a swim. Miss Pain was also the Brownies Brown Owl in the town so already knew some of us – very correct and firm, but kind I remember. She was a huge fan of Roman history and poetry and we had to learn chunks of Hiawatha and poems by Rupert Brookes and Kenneth Graham. Like all the staff she was a stickler for the uniform being 'respected'. Like others who lived in Faringdon I was told off for speaking to a boy, talking to pupils from the Secondary Modern and eating an icecream while in uniform - trying to explain that it wasn't possible to ignore friends and sisters did not go down well. Joan and Bridget Fletcher in the earlier 1950s. Both were academic and sporty and went on to have successful professional careers (Joan died in 1975) and had only recently left so they were a hard act to follow, given that I certainly wasn't sporty and fairly average academically. It was lovely to pick out all three in the school photos. I remember sports day and the run up to it being especially tortuous having to at least take part in the House game. Living in Faringdon also meant that one was required to volunteer on summer Saturdays to ball-boy for tennis matches. In most respects school was very regimented and formal, because Miss Bell and Miss Osbourne ran things, although Miss Towns encouraged much more science and in due course things became more relaxed, perhaps as younger members of staff joined. 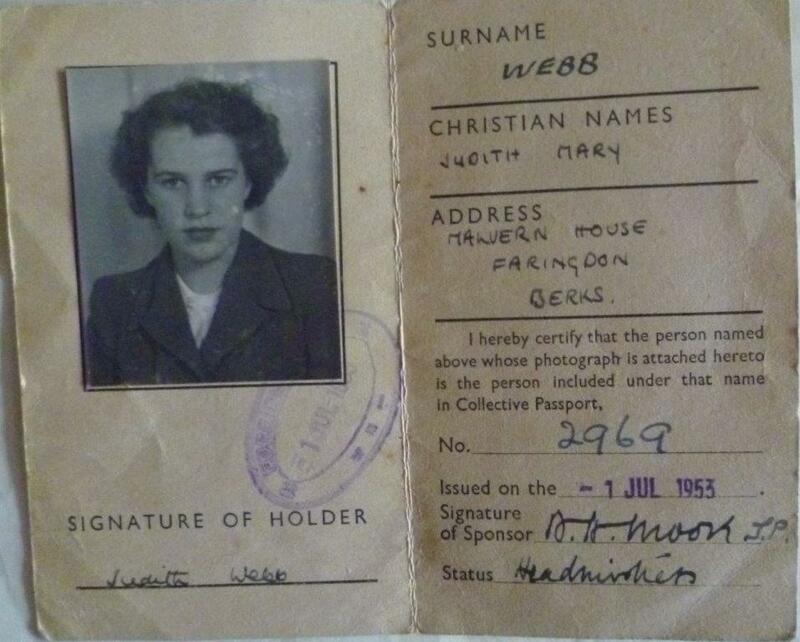 Although a reserved lady she was immensely kind and supportive – as I came to know personally when I was allowed to attend part-time for a term or so to assist nursing my terminally ill father. A glamorous new French teacher arrived who wore high heels and tight skirts, and new head of English – Delia Watson. Delia was pretty fearsome, although a brilliant and inspiring teacher – who could hurl a blackboard rubber with great accuracy and informed us that as an ex-WRN she knew more swear words than any wayward pupil. She reorganised the library and instituted the Dewey System, involving anyone who was interested and arranged theatre visits to Stratford and Oxford. She was probably the only teacher that took careers advice seriously – up until then unless it was University or teacher training no-one bothered much. Years later she married my uncle Norman Fletcher which took some getting used to. A new Art teacher arrived (sorry can't remember her name) to replace the lovely Miss Liddiard – all very modern and a bit of a shock to some of us. However she and Miss Watson and probably others decided the school would put on some Gilbert and Sullivan, which were a great success and provided opportunities and fun for not only those who could sing and act but scenery painters and props and costumes. Local people and business were generous in lending bits and pieces for these performances. Being a sixth former, Upper was 6A and Lower 6B, certainly changed things. Teachers behaved differently – more friendly, less formal and approachable - which was such a surprise and we had some perks. 6A acquired a small common room in the old part of the school with a window opening onto a flat roof – perfect for sunbathing or an illicit cigarette for a daring one or two – and free periods during the exams could be spent out of school so a group of us watched Wimbledon and ate doughnuts at my house or piled into Christine Lock's car for brass rubbing jaunts around village churches. Our uniform changed too – pale blue blouses, from the school tailor but pleated skirts we could buy anywhere and stockings instead of socks. The felt hat, by now a mishapen affair was replaced for summer with a boater which I liked but caused much ribbing from the other school and labelled us a 'snobs' ( You’ve no idea the gauntlet we had to run between school and home wearing those boaters!!!!!!!!) and nice summer dresses. Then there was the first sixth form school dance – boys being invited from King Alfred's in Wantage. Miss Bell had to turn her attention from the country dancing she taught us to ballroom dancing; I'm not sure we were very expert at the waltz, quick step or polka, and neither were the boys. It all felt a bit desperate as I recall. Of course there was also the agony of what to wear, and the spectacle of those teachers who supervised in their best frocks – Miss Watson causing the most comment in her fashionable cocktail dress. On our last day, under the cedar tree, we all signed each other's felt hats, swapped addresses and went out into the real world. 1950s and 1960s. Grey bibbed pinafore skirt, blue check blouses (winter). Blue gingham dresses (summer) Grey felt hat. Boater in 6th. PE Short elasticated waist dress called 'greys' There was the rule that your boater had to be parallel with the ground and we couldn’t put a tuck in our felt monstrosities to make them a bit more on trend!! Also, our skirts had to be at least two inches below the knee...despite the fact that our greys were skimpy and the old men used to enjoy watching us play netball and tennis and hockey, watching over the wall from Lechlade Road. Happy days!! I remember Miss Towns saying we weren't allowed to talk to pupils from the local Secondary Modern School. I can't remember if there was an explanation or discussion- I doubt it. I probably wouldn't have had the courage to ask if that included my brother! Miss Bartels was the headmistress and very strict! ​The girls all delighted in having French lessons and they had the occasional French trip in the summer holidays. In those days they had very strong Tennis and Hockey teams and normally came top of "the league"
In Sept.1954 the school started to have a 3 form entry instead of 2. This created an accommodation problem. My first year classroom was the cricket pavilion situated by the hockey field. This was perhaps a 10 minute walk from the main buildings. We walked there for registration and back to the large hall for assembly. We returned again after assembly having most of our lessons in the pavilion. There was no flush toilet. The desks were very close together. We had specialist teachers for French and Latin and PE. All other lessons were taken by Miss Pain during our first year Nearly all lessons took place in this pavilion which was like fridge in winter and an oven in the summer. My second year classroom was on The Platform. This was an area behind the large hall only used for concerts and speech day. It was closed off from the main hall most of the time. I can remember having to move all our desks out for these occasions. By the time I got to the 3rd form a proper classroom was available. New classrooms were built during these years. ​Until the school had its own swimming pool we went once a week during the summer months to the swimming pool in Buscot Park. This was not popular as the pool water was always green and most uninviting. Everybody was expected to go in wearing our old fashioned wool regulation costumes. This was not an enjoyable experience. Unusually for most girls schools we played cricket in the summer. We had an annual match against a girls school in Abingdon. When they came to us lessons were stopped and we watched the match. We were given score sheets to fill in. On no account should we call out the name of a player. To encourage the school team we were allowed to call, Come on School. I don't remember this continuing after about 1957. Miss O' Donnell taught History after Miss Hunter left.She was young,enthusiastic and inspiring.We liked her because she came from Liverpool (this was the beginning of the era of the Beatles) and she lived in a flat in Oxford which we thought was very sophisticated. Miss Watson taught English.She was formidable and strict but we all recognised her love for the subject. Miss Thomas taught Geography and she used to be a stickler for us wearing our hair tied back.Flowing hair leads to flowing brains she would say. When drawing maps we had to "baby blue the sea" which involved colouring it in with light blue and then rubbing it over with blotting paper (remember that? )We had to answer questions following a formula.It was either "what do you understand by........?" and we had to say what it was,where it was and something else important or "account for..... which involved writing five facts about a topic.She was reputed to have had a bad experience during the War which made her react badly to low flying aircraft. Miss Osborne also taught Scripture, as it was called. There was the rule that your boater had to be parallel with the ground and we couldn’t put a tuck in our felt monstrosities to make them a bit more on trend!! 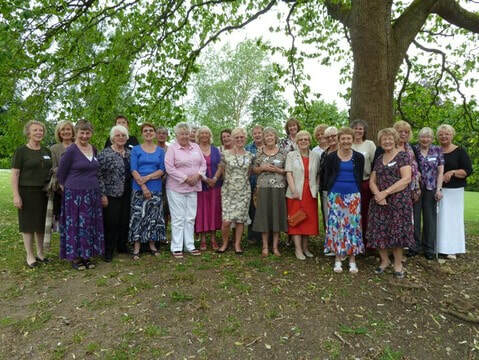 Also, our skirts had to be at least two inches below the knee...despite the fact that our greys were skimpy and the old men used to enjoy watching us play netball and tennis and hockey, watching over the wall from Lechlade Road. Happy days!! ​I have today looked at the Faringdon website for the first time and was thrilled to read articles about Faringdon County Grammar School which brought back happy memories. I am in touch with Joan Towns regularly and she suggested ages ago that I should write something for this site. 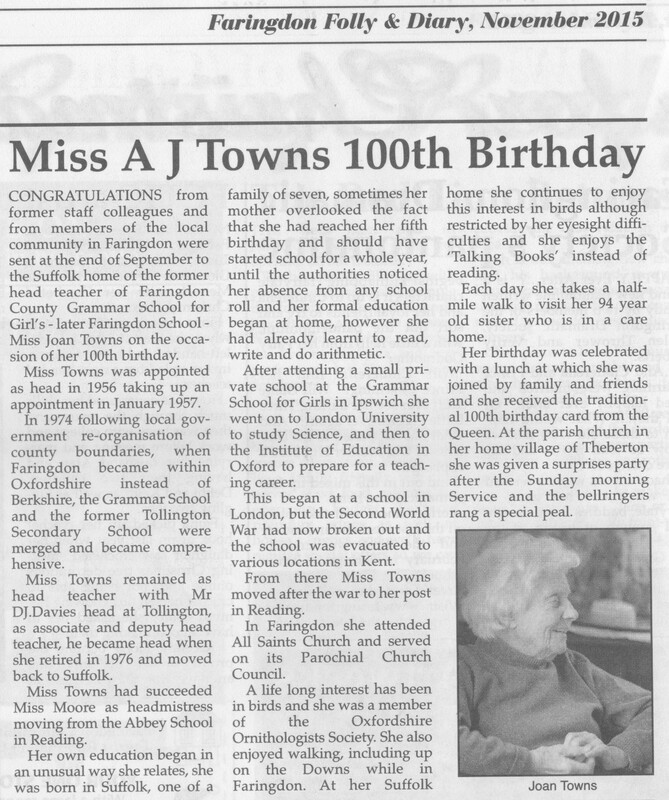 Happy 101st birthday wishes to her for next month!